As education continues to expand, it's always taking on new characteristics and new ways of being. The convenience of learning anytime-anywhere and at their own pace is an attractive prospect to any student of the 21st century. As such, there is a demand for trusted online portals that allow students around the globe to take charge of their learning. These are organizations offering high-quality courses, engaging resources, and top professional coaching and online support to enhance their online learning adventures. Open Colleges is one such portal. Currently Australia's leading online educator, they are serving over 700,000 online learners, and offer over 150 courses in a multitude of different fields of study. This is a resource they created called "Cyber Safety: An Interactive Guide to Staying Safe on the Internet" and it's quite something to see. They've produced this interactive page to serve as a tremendous resource that focuses on aspects of digital citizenship that are important considerations in any online environment. The first thing you'll notice about this colourful interactive online guide is the little flying superhero that moves around as you explore. It's a great little feature that holds all the links to the various sections in the guide, and that allows you to skip to any section you prefer. The guide includes sections that profile such important topics as cyber-bullying, identity theft, plagiarism, and lots more. Each section provides tons of information on each topic including several examples and categories that help define the problem clearly. In addition to this, the sections for each also provide practical tips and preventative measures that you can employ to keep yourself safe online. It's a dangerous cyberworld out there, and being armed with the kind of information offered in this brilliant interactive page will help you keep both yourself and others as safe as possible on the Internet. 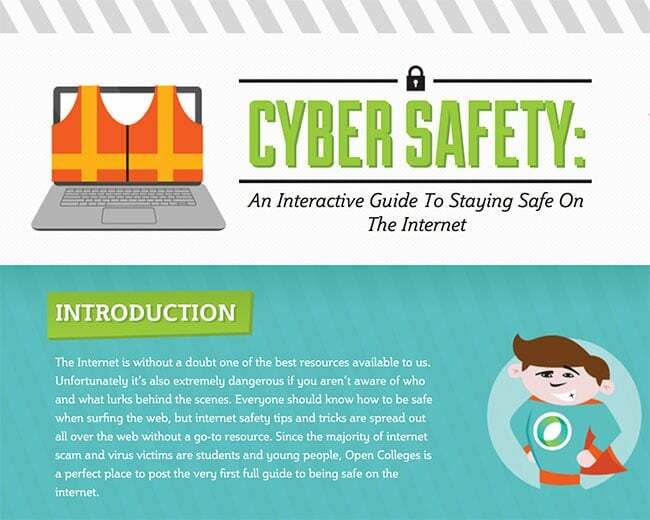 In addition to other topics, the Cyber Safety Guide also offers a pretty comprehensive section on general Internet safety. It covers topics on staying protected while doing general web surfing, and also safety tips for social networking, and privacy measures. There's even a safety quiz for kids that utilizes real-world examples of potential online dangers to give young ones a real sense of the kinds of things they can encounter in a digital environment that can sometimes be unstable and unpredictable. This has just been a brief overview of what you can discover in this handy online guide. We definitely urge you to follow this link and enjoy exploring this tool for yourself. The gang at www.opencolleges.edu.au have really outdone themselves with this fun interactive guide. Be sure to check it out!